This Master 150mm Filter Holder Kit from Benro is designed to allow for the use of up to two 150mm-wide, 2mm-thick filters, along with an included circular polarizer filter, on a wide-angle lens with 95mm or 77mm front filter threads without vignetting. Besides the circular polarizer, this kit contains two additional filters that can be used individually or in various combinations to improve the results of your photography. Those filters consist of a 150 x 150mm solid neutral density 4-stop filter, as well as a 150 x 170mm graduated neutral density 3-stop filter. 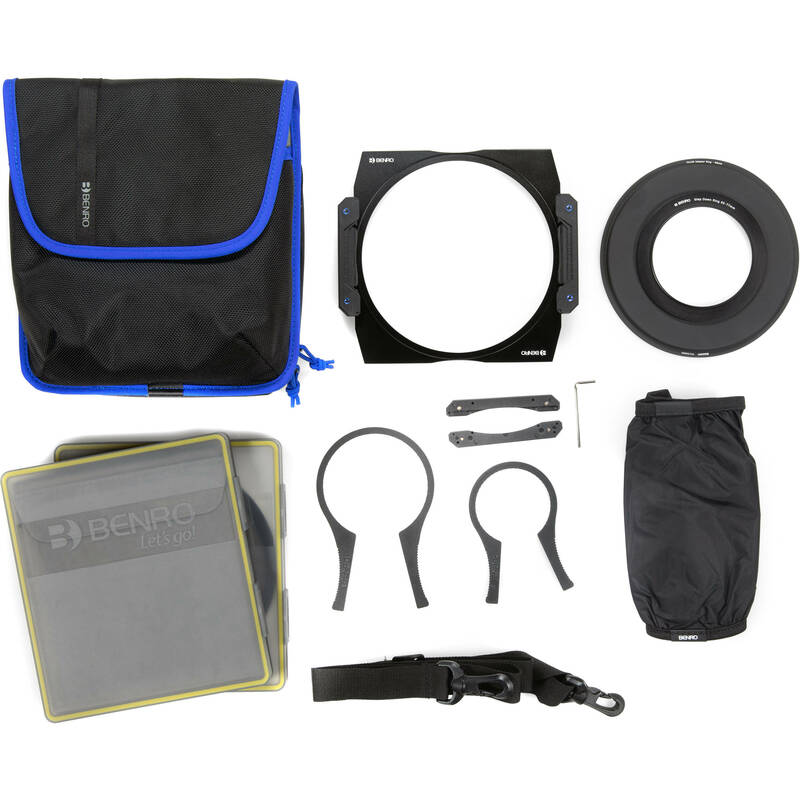 Along with this kit's Master 150mm Filter Holder, 95mm filter holder adapter ring, 77-95mm step-up ring, three filters, and two filter wrenches, a light tent is provided along with a padded pouch. If a jammed or over-tightened screw-on filter requires removal from a lens before using this kit's adapter ring or step-up ring to mount the filter holder, the squeeze-type filter wrenches can help to enhance grip and leverage around a filter ring. Together, the wrenches are compatible with filters ranging from 46 to 72mm and 67 to 82mm in diameter. By covering the sides of the filter holder during use, the light tent can be used to eliminate stray light, which could have unwanted effects on exposure, from coming in-between any installed filters and the filter holder and lens behind it. For storage and transport, the pouch accommodates the entire filter holder kit. The Benro Master 150mm filter holder combines clean, functional design with manufacturing excellence. Precision machined from lightweight aluminum alloy, it attaches quickly and securely - and is easy to use. This holder will quickly become a seamless extension of your camera gear, allowing you to focus solely on capturing the image. The Benro Master 95mm lens mounting ring enables the Benro Master 150 filter holder to be attached to a 95mm threaded lens. Prevent stray light from affecting your photos with the Light Tent from Benro, which is designed for their FH150 150mm filter holder. This simple accessory is made of black fabric and goes directly over the holder and whatever filters you have installed, featuring elastic bands on both openings for a tight fit. It blocks unwanted light coming from the sides of your setup, helping you avoid flares or other reflections that can show up on your images and degrade its quality. The Benro 150 x 150mm Master Series ND 1.2 Filter is a neutral density filter with a 16x filter factor that provides a 4-stop exposure reduction. Its 1.2 density creates a darkening of the entire image, allowing you to photograph with a wider aperture or slower shutter speed than normally required. By increasing your aperture or slowing your exposure time, you can control depth of field and convey movement more easily. Neutral density filters do not affect the coloration of the image and are ideal for pairing with other filters. Designed with professional landscape photographers in mind, this 150 x 170mm Master Series Soft Edge Graduated 0.9 ND Filter from Benro has an 8x filter factor that provides a 3-stop exposure reduction in selected areas. This specific model features a soft edge in its center, fading gradually from completely clear to darkened as we move towards the top. This allows the filter to keep bright skies under control without creating a line in the image, making it ideal for pictures without a clearly defined horizon line. The Master Series filters are made with Schott B270 glass and finished with several different layers of coating. These layers increase the resistance of the glass to avoid scratches and help keep the surface waterproof, making it easier to clean when shooting in inclement weather. Additionally, the filter is designed for a neutral performance that avoids affecting color rendition and curtails the unnatural colors found in some pictures with high contrast. The 46-72 and 67-82mm FTU1 Filter Wrench Kit from Benro is used to remove lens filters that have become stuck or for filters that have been stacked together and bound. Place the wrench around the diameter of the filter, squeeze the two ends of the wrench, and turn it counterclockwise to remove the filter. Store, protect and transport your filter holder and filters with the black Benro 150mm Master Series Holder and Filter Bag. The bag features a head height of 2.56" / 6.5cm, solid construction, and individual storage sleeves to protect your holder and filters. Box Dimensions (LxWxH) 6.75 x 6.75 x 0.6"
Box Dimensions (LxWxH) 9.0 x 4.5 x 1.0"
Box Dimensions (LxWxH) 7.5 x 6.9 x 0.8"
Box Dimensions (LxWxH) 7.9 x 7.0 x 1.0"
Box Dimensions (LxWxH) 6.5 x 4.0 x 0.1"